Inside the package, False Eyelashes and Glue are Separately Packaged. Me with False Eyelashes on. 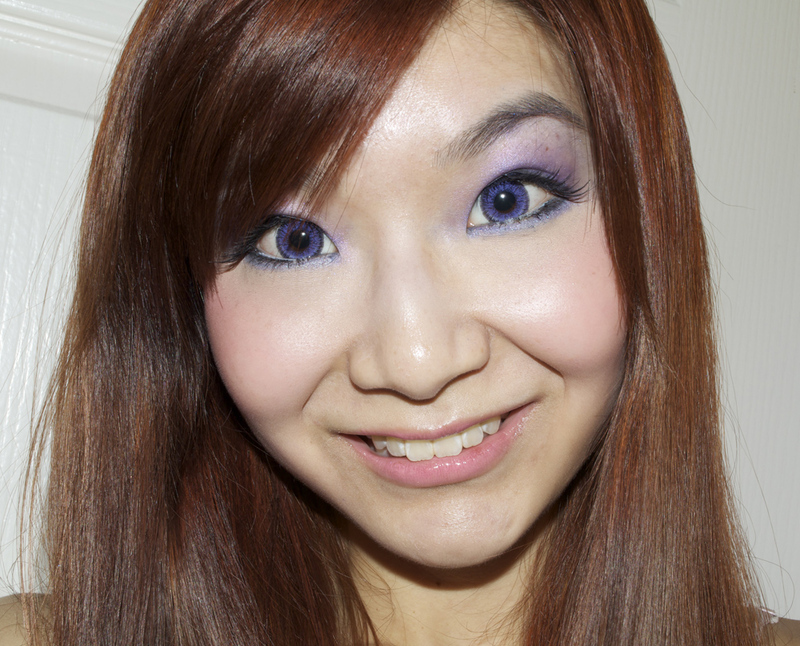 Notice that there's no reflective glare from these lashes even with Flash photography. They also blend in with my natural lashes well! They look very natural, almost like my natural lashes! 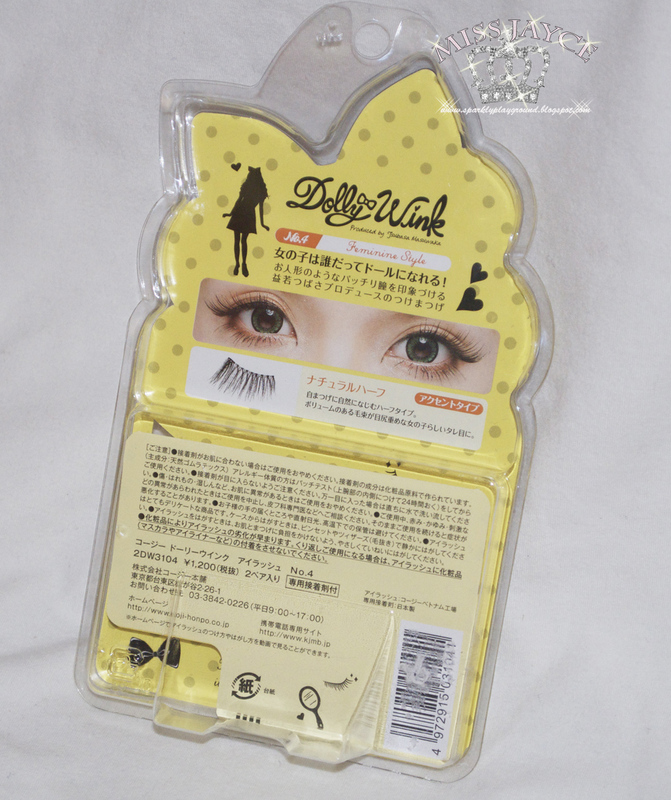 Koji Dolly Wink No.4 Feminine Style is a false eyelash that helps to create a girly but with a bit of mature feeling. This false eyelash is a half type lash that is focused on adding a length and volume towards the outer area of the lashes. It is able to create a natural looking lashes with longer lashes to create slight downward cute slanting eyes. Koji Dolly Wink Eyelash No.4 Feminine Style is fake lashes that naturally integrate with genuine lashes. It gently highlights the end of the eye, allowing you to have an elegant temperament. It can be used repeatedly. 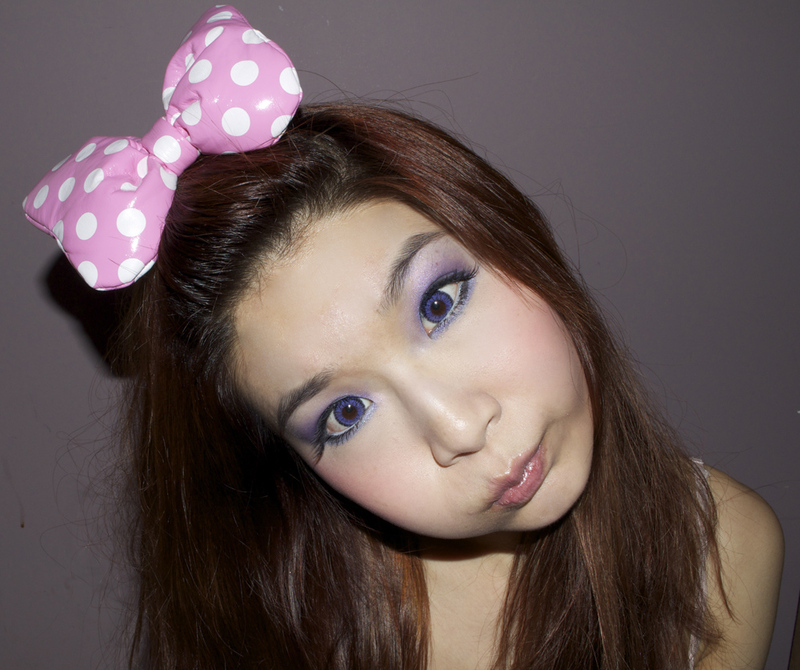 The Dolly Wink range has been created in collaboration with Tsubasa Masuwaka, who is a famous Model/Actress in Japan. First of all, thank you once again to Amanda from http://amanda-hky.blogspot.com! I won this item from her birthday giveaway! Otherwise, I wouldn't be able to get my hands on these here =P These eyelashes are extremely limited in Toronto and it is quite pricy too. I wish I told my bf to buy these for me when he was in Hong Kong. Oh well. I really like these overall. I love the Clear Band, however one of my pair's band was rather thick (don't know why). I asked Emily, and hers didn't have it. So it's not a big deal, I guess. When I took them off of the packaging, they are a little stiff. TIP: bend it a little by making the lashes curve so that it won't be straight. If the lashes are too straight, especially for Half Eyelashes, it will make the center of your eyes appear pointy. I find that these Half Lashes are very convenient because I don't need to cut them and it even comes with Lash Glue. I can apply these lashes on the go (like on the bus ride to school) I did find that the Lash Glue dries very fast though compared to Ardell's lash glue. I like this because I hate waiting (even 20 seconds is too much) And aside from the large yellow packaging, the lashes and the glue was in another plastic packaging so I can simply slip these into my make-up bag. Product: 5/5 ♥ Feminine, Fun, Flirty. Easy to Use. Convenient. Re-Useable. Packaging: 5/5 ♥ Super Chic! I love it! So girly and kawaii! Price: 4/5 ♥ It is relatively pricy compared to other eyelashes on the market, especially for girls not from Japan, it is often overpriced. I just updated my "To-Blog" List (It's SO long) I've yet to review so many items because of the workload from school and the online store. Sorry! I will get to them as soon as I can!